Proclear Toric Extended Range lenses are monthly disposables that correct astigmatism, provide all-day comfort and support eye health. Made by major optical manufacturer CooperVision, they combine sophisticated design with durability. These contact lenses come in a wide range of powers, from -10.00 to +10.00 and are recommended for wearers who spend alot of time looking at a computer screen or suffer from dry and easily irritated eyes. 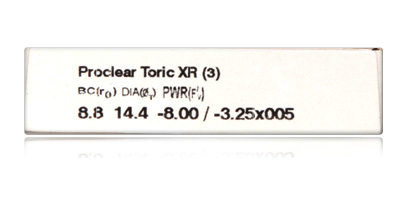 The shape and width Proclear Torix XR makes for a comfortable and stable fit. Proclear Toric Extended Range lenses stay in position from the time you apply them right up until removal. Wearers enjoy constant crisp, clear focus and freedom from blurred vision. 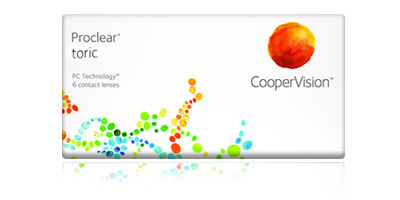 A particularly high water content and carefully selected biocompatible materials makes CooperVision Proclear Toric Extended Range an excellent choice for wearers concerned about eye health. The high water content allows oxygen to pass through to the cornea easily, helping the eye to breathe and avoid the effects of oxygen deprivation. If you work in an air conditioned space and need a hard working lens for astigmatism, this is a great place to start. These monthly disposables are made from a soft material called Omfilcon A and feature CooperVision�s unique PC Technology. This smart system produces and maintains moisture by replicating the behaviour of the eye�s natural cells. Eyes stay continually hydrated, feel fresh and look bright. 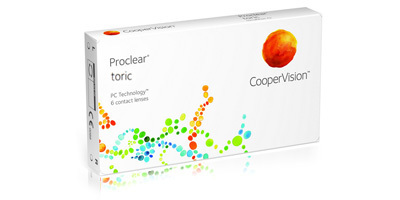 Three lenses are included in each box of Proclear Toric Extended Range monthly disposables. If you have any questions or need advice on choosing the right contact lens, please call one of our advisors free on 0800 037 4000. 98% of orders placed with Contact Lenses Express are sent out for delivery on the same day.